KIKI Health Genuine Zechstein Magnesium Oil Spray is a saturated solution of magnesium chloride that is applied directly to the skin, where it is reabsorbed and transported to the cells. 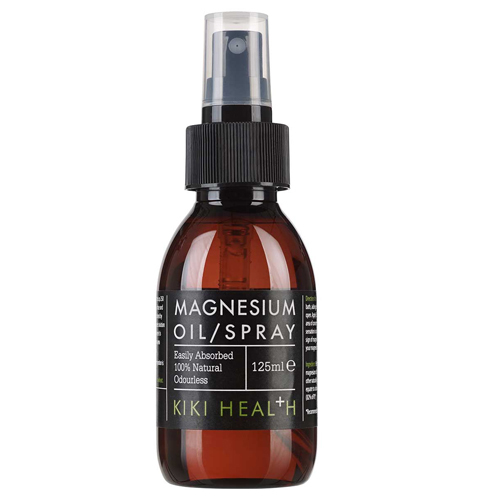 KIKI Health Magnesium Oil is easily absorbed, 100% natural and odourless. For 250 million years Genuine Zechstein™ magnesium salt has been protected deep within the Zechstein Seabed at a depth of 1600-2000 meters beneath the earth’s crust, isolated from the impurities of the modern world. It has been extracted in a preserved state from an ancient time millions of years prior to our modern age. KIKI Health`s Magnesium Oil Spray utilises only Genuine Zechstein™ magnesium chloride. There are no added ingredients except those found naturally occurring in the deep underground deposits of this pristine source. Purified water and genuine Zechstein Inside magnesium chloride (31% magnesium chloride) and other naturally occurring trace minerals. Apply 5 to 20 sprays to the area of concern in the morning and at night and lightly massage into the skin. A tingling sensation is natural upon your first application, this is a sign of magnesium deficiency. This will decrease as your magnesium levels increase. Below are reviews of KIKI Health Magnesium Oil Spray - 125ml by bodykind customers. If you have tried this product we'd love to hear what you think so please leave a review. I buy this product for a niece who cannot absorb Magnesium from her diet. She's very sporty and active and needs Magnesium - a vital element for physical and mental well-being. This product gives her what she needs easily - no Epsom baths required! Best anti ache and magnesium top up I am pleased to use! Kiki Health products I have used have great efficacy will certainly keep this product in stock! I received this during the promotion with a £20 spend on Kiki Health a couple of weeks ago. I have been trying to use up the obviously inferior product I purchased previously on my golfers elbow ( fell on my elbow down some stone steps almost 40 yrs ago, so I believe it's the aftermath of that injury) and nothing seemed to improve much, until I thought ok, let's see what happens with a couple of sprays from this brand new bottle. Well, all i can honestly say is, "WOW!". All morning, every time I lifted my arm or used certain fingers I had been wincing until I realised about twenty minutes after application, I was moving my arm and fingers without feeling a thing. Will be leaving an update further down the line now. Seriously, impressed and grateful to Kiki Health and Bodykind. Thank you!